We are Calgary’s highest retail sales volume dealerships with one of the largest Mazda inventory’s in the market. We strive for Customer Excellence and making sure all of our customers are “Completely Satisfied” which is why we some of the highest Ratings on Google, Facebook, Dealer Rater, etc. We take great pride in being Calgary’s only independent dealership for Mazda; A fact that truly shows in our one of a kind sales and service processes. Due to our high inventory and volume of sales we do work aggressively to make the right deal happen for you. Please give us a call or send an inquiry so we can make your purchase experience the best you have ever had! And remember, if we happen to not have the Model/trim/ or color of your dream Mazda, we can get it for you. *Plus applicable taxes and licensing. While every reasonable effort is made to ensure the accuracy of this information, we are not responsible for any errors or omissions contained on these pages. Please verify any information in question with Sunridge Mazda. SKYACTIV-G 2.5 with Cylinder Deactivation 4-cylinder / in-line engine - 4 cyl. 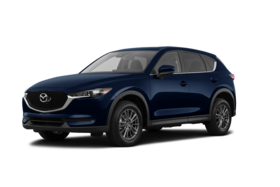 Interested by the 2019 Mazda CX-5 GT 2.5L AWD ?